Positives: Made his Cardinal debut in September after being acquired from the Yankees in the Luke Voit trade….struck out two of the five batters he faced in the major leagues….struck out the first two batters he faced as a Cardinal….posted a 0.54 ERA at Memphis after the deal….had a 0.60 WHIP at Memphis….lefties hit .040 against him down in Tennessee….batters hit .071 when he was ahead in the count at Memphis….did not allow a run at AutoZone Stadium. Negatives: Gave up a hit in his only bases-loaded situation of the year (with the Yankees’ AAA squad)….gave up six runs in 7.1 innings to start the season….allowed five runs in 10 innings in his callup to the New York major league squad….batters hit .286 when he was behind in the count at Memphis. Overview: Look, if you knew Luke Voit was going to be the second coming of Babe Ruth for the Yankees, maybe you ask for a little bit more but on the whole, getting Chasen Shreve and Gallegos looked to be a good return and most likely it will be. Shreve is another story but it wouldn’t be a surprise if Gallegos was really the focal point of the deal. His minor league career looks promising and I imagine, unless his major league experience disqualifies him, he’ll probably be in the Top 10 of Kyle Reis’s offseason prospect rankings over at Birds on the Black. 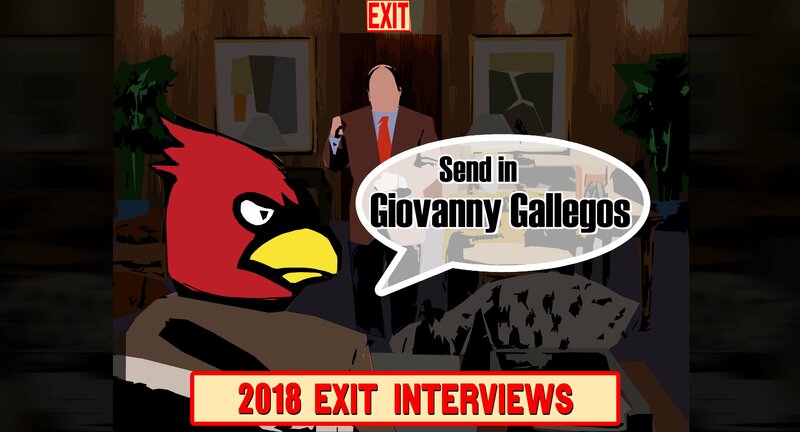 Outlook: Depending on how the Cardinals approach the bullpen this offseason, Gallegos would seem to have a strong chance of breaking camp with the major league squad. If nothing else, the fact that he still has an option remaining would be attractive as the Cards would have the option to rotate him with others to keep arms fresh. Given his performance with the Redbirds, I’m pretty intrigued and ready to see Gallegos get a little more responsibility out of the bullpen.